We currently have branches related to: Karavan, Kami, Marauder, Neutral, and...yes... more! Nomad— sometimes called foragers — are the oldest type of nomad. They have been around since the beginning of homin history. As their name suggests, they move about frequently in search of good harvest, that change with the seasons. They have no permanent abode and move from place to place, usually seasonally. 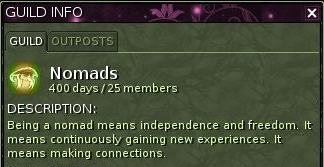 Nomads was created for the player that enjoys harvesting and crafting, the player that is independent and resourceful, for the player that tends to play solo but enjoys an active guild chat, the player that likes to play his way without being told how to play. We don’t care if you are the type that stands by the stable while binge crafting, or spend all your play time harvesting and storing mats. Nomads is for players that don’t need to get to endgame content in a week, players that seek the journey and explore Atys in focus gear (literally, we all do it). This guild was created for new and veteran players that enjoy the challenge of playing without being pushed or limited by guild politics or play styles. There are no leaders in Nomads only co-founders, there is no dictatorship, nobody telling you how to play. We will only offer guidance and point out options for you to make your own decisions. We are simple, fun loving homins and not overloaded with multimasters. Most of us are proudly undergeared in our degraded sets =) We won’t immidately supply you with gear, but will always do our best to help where we can. We are also happy to help you make your own, help shop/ trade/barter or pass-on our handmedowns, we are nomads after all! We offer a truly stress-free experience. Nomads come and go, but they always come back home. They wander alone or in groups, they help and are helped if they wish. Nomads are family, always together though spread apart. Update: We have a German member, and one honorary nomad also German - plus one French nomad and one somewhat-fluent. We do hope one day to have everyone, because the ideals exist across all languages. I am a french Ranger, from the Guild "le Cercle Bois d'Almati". Go Nomads! Yay! Glad to have you with us! In a bid to allow better high level play Nomads have spun off two associated guilds to allow Kami/Karavan aligned players of the nomadic disposition association. See Jahuu for "Kami Nomads". 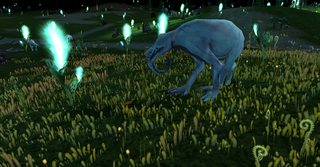 This allows the nomads of Atys to align and use q250 TP where it is beneficial to their gameplay. The inherent nomadic attitude is still a core aspect. Nomads now welcomes aligned players! 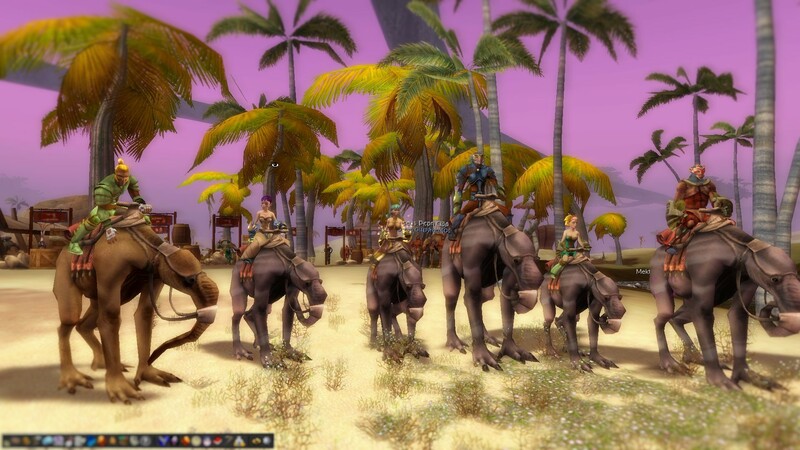 Stable slacking with all three nomad guilds! The Nomad way is a lifestyle that goes beyond religion or race =) put your feet up with us and stable-slack! Want a mature crowd? Want some relaxed but meaningful company? Want to do it your way and avoid politics? Please contact Loved, Jahuu, Notsobright (internet difficulties at the moment) if you are interested in who we are and what we do. Relaxed, relaxed, it is quickly said, you almost crashed me with your mektoubs last night in front of Fairhaven. hello i am new. i like the sound of your guilds concept of playing the game. Regima, thanks for taking the time to write. Spoiler: Old news! Contact anyone from active list! For now I'd have to say Nomads are inactive and not recruiting. That might change in the future tho, stay tuned! Great idea on the guild may you return stronger. Any of the founders around?